I just bought the Letters of Ted Hughes, edited by Christopher Reid (Faber and Faber, 2007). Maybe because I write about the land and sheep (! ), the Don (MacKay) told me to read Ted Hughes. So I went out and bought Hughes’ Collected Poems and wormed my way through that over the past few years (leaving quite a few holes), then of course because of the Sylvia connection, I tiptoed through her work (careful not to actually step on the graves), and then their various bios (many of which were literary CSIs) and Plath’s journals (one can see how doomed the pair were even before they met). note that spelling and punctuation errors are left by the editor… I like that. I love reading collected letters; they let us enter the writer’s lives and mind. And while there is absolutely no need for another human being to weigh in on the Hughes-Plath marriage, reading his letters from around the time of their meeting and marriage, one is struck by how very young he was, emotionally, and unprepared for the stuff of life (the practicalities), never mind caring for someone who was so deeply unwell. Jose-maria was on Radio Voz in Galicia this morning talking about our pilgrimage and fundraiser! Let’s hope some of the local news outlets are interested too. we make the Galician newspapers again! Yesterday, I picked Ella up from school and headed downtown to the CBC studios for an interview with Jo-Ann Roberts of All Points West. 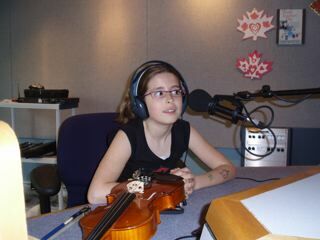 What can I say about a ten year old who sits back on the couch in the broadcast studio, book in hand, while Jo-Ann is broadcasting to British Columbia, then puts on the headset, saddles up to the microphone and speaks ten times more eloquently than her writer mother ever could, answering each question of the interview without hesitation, then picks up her violin and plays Morrison’s jig up to the hour until the news feed comes in?! To hear interview, click on highlighted words below! As I said on the broadcast, Ella will certainly be setting the pace. All 750 kms of it! an evening of music, dance, spoken word with: Daniel Lapp, the BC Fiddle Orchestra, Alma de Espana Flamenco Troupe, introducing Gareth Owen, Quinn and Qristina, Nat Roberstson, Charles Tidler, Ken Farqaharson, and spoken word by: Anne Simpson; Tracy Hamon; Colin Will; Tom Bryan; Daniel Tysdal; SMSteele; Maureen Scott Harris; Isa Milman; Modesto Fraga Moure and Diane Douglas.